Art imitates life, but maybe too much in the case of Swiss artist Carol May’s ‘Unhappy Meal’ given that it got binned. The sculpture, made to look like a McDonald’s Happy Meal box but with a frowning mouth, was thrown out with the trash by cleaners following an art fair. According to the Local, staff at the Marco Polo hotel, Hong Kong, disposed of the 2018 piece. The staff reportedly realised the mistake, but the piece was irreparably damaged. The art fair a-space founder Roy Hofer, who had been showing the piece in a roving show, also told Hyperallergic he found the incident “disturbing”, and said they were waiting to hear about a solution from the hotel. 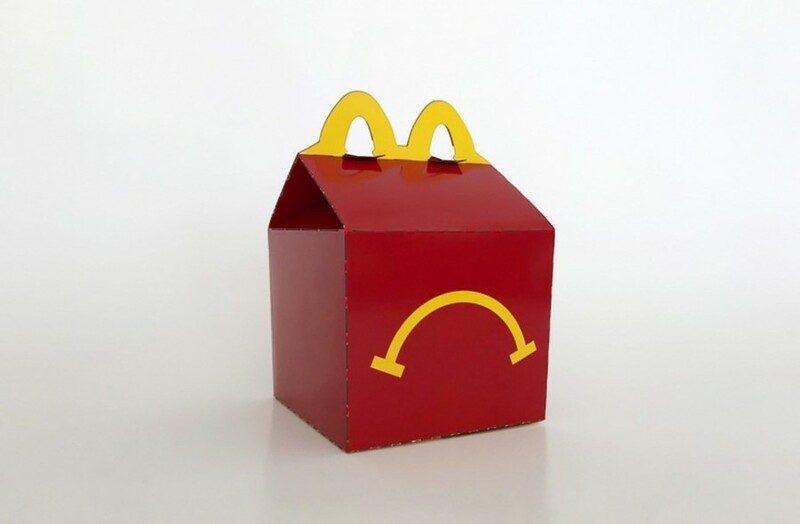 ‘Unhappy Meal’ a screenprinted cardboard artwork, was valued at an estimated $364. It’s not the first time contemporary art has figuratively and literally been binned. A Damien Hirst installation – piles of ashtrays, coffee cups, and beer bottles –at London’s Eyestorm gallery was cleared up by a cleaner who thought they were pieces of debris from an event back in 2001. In 1999, a woman travelled some 200 miles from Swansea to London in an attempt to clean up Tracey Emin’s “My Bed”.